Home / Engagement rings: Custom Design / Cushion Cut / “Lauren” intricate halo cluster ring. “Lauren” intricate halo cluster ring. 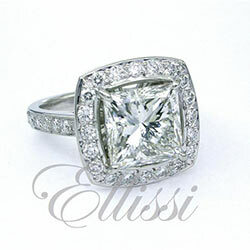 A very individual halo cluster designed by ellissi for a client. At its heart a 1.00 ct “Cushion Brilliant” a very rare cushion type with the best cut possible for this diamond shape. Very fine detailing on all claws and edges gives an intricate look to the ring, with the central diamond being held in a triple corner claw setting. Round brilliant cut diamonds complete the halo. 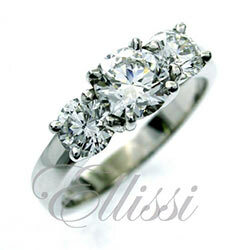 This design has larger corner diamonds that are elevated, which gives further depth to the design. “Suhaila” Cushion modified diamond solitiare. “Duo” Double banded diamond solitaire ring.